One of the interesting things that I’ve learned from the travels of my good friend Eric Luk (who is currently hitch-hiking from London to Hong Kong) is that YouTube is banned in Turkey. Speaking on Turkish television on Saturday, Mr Yildirim said the ban had been lifted after “common sense prevailed”. “But we didn’t get here easily – we have been through a lot in the process,” he told NTV. “I hope that they have also learned from this experience and the same thing will not happen again. YouTube will hopefully carry out its operations in Turkey within the limits of law in the future,” he added. In a statement, YouTube said that it had received reports that some users in Turkey were once again able to access its content. I’ve now updated my About Me page to reflect the fact that (1) my dissertation is actually done, and (2) I’m going to graduate with distinction (which is great news!). Today’s post has nothing to do with social media! Instead, I’d like to post a few pictures that from my birthday earlier this month when my wife and I walked from Princes Street back to our flat in Newington, taking us from by the National Gallery of Scotland and Princes Street Gardens through The Meadows and back to home (although we’re moving in a few days, so not for much longer). It was a ridiculously beautiful day in this, one of the world’s most beautiful cities, so I thought it would be nice to share. BEFORE you post that umpteenth status update about your toddler’s latest witticism or your feelings for Glenn Beck, consider this: According to research by a graduate student at the Business School at the University of Colorado, Denver, the top two reasons that Facebook users unfriend people is that they post too frequently on trivial topics or about polarizing subjects — particularly politics and religion. Not everyone, it seems, really wants to be friends with everyone. According to the study, those who initiate a friendship are more likely to be unfriended than those on the receiving side. This seems to mirror the real world. Research shows that people who make friendship overtures tend to be of lower social status than those courted. It may be that the recipient of a new friendship, whether off- or online, values those relationships less than the initiator does. For more, see this post at ComMetrics. Overall, I have to say that this research does not particularly surprise me, and I think that the results would probably be even more robust if they had also included who people ‘hid’ from their newsfeed, since that is a step short of fully unfriending someone. I unfriend people only very rarely, but I have certainly hidden people from the news feed if they clog it up with too much trivia or half-baked political ranting, and I’m sure that I am not alone in having done so! For brands, what this research shows, in my opinion, is the important of balance. Obviously you want your fans to engage with your content (and then hopefully convert that engagement into actual sales), but at the same time you need to be careful that you do not overdo it and annoy them, and that your messages are interesting but not polarizing, although perhaps it is ok to be controversial and polarizing if you are looking to energize a relatively small group of passionate fans. Just so you know, my Twitter account is @sonicrampage. Note: This is the full transcript of an interview conducted by email with Brett Keintz, Director of Social at Groupon. Before joining Groupon, Brett was CEO and founder of Sharethrough. Only a few quotes from Brett were included in the final dissertation (which will be available Monday, by the way), so I would like to thank Brett for allowing me to post the full interview here. Randall Helms: I am working from the hypothesis that, for brands, social media is better suited to engaging with existing customers than it is for reaching new customers. Do you agree or disagree with this hypothesis? Why? Brett Keintz: It really depends on how you define social media. Do you mean on Facebook or Twitter, period? Right now, Twitter is better for existing customers because they don’t have an ad product. Facebook does, and they find new customers for games and Pepsi and other products through their advertising products. Anything that is as invasive as traditional advertising works to get new customers. But for beverages and other companies that spend a lot in traditional media, the volume of new customers you can gain just isn’t there yet for even Facebook, much less Twitter. So in short: I think you’re right now for Twitter, and mostly right for Facebook; but I think that will change as you see more invasive (interruptive) advertising products released on all of those platforms. 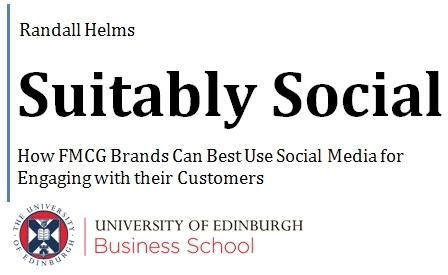 Randall: I am looking specifically at how consumer goods brands can best use social media; do you see that there are any specific challenges for such brands in the social space as compared to other branded products/services? Brett: It’s a 24/7 job, which is different from tv advertising. You have to have people monitoring and responding and engaging all the time, which makes it more like a customer service/support position than a traditional marketing position. And it is much harder, requiring creativity and latitude for those engaging with their consumers in order to do it well. Command and conquer doesn’t work nearly as well with social media, because individual brand ambassadors have to be able to engage and react quickly or be rendered ineffective. It is essential to remember that social media is interactive. This may seem obvious, but too often the implications of this are forgotten as marketers try to replicate within social media approaches that worked in the past in other marketing channels. This is the wrong approach, because people do not experience the internet in the same way that they experience newspapers, radio, or television. This is especially true for social media, and it is imperative that marketers remember that because the experience is different, therefore the marketing approach has to be different. Social media is not just a broadcast medium. Simply putting out a message along the lines of “our brand is really great, you should buy it, and if you do it’ll make you cool” is the wrong approach. It might bear a little fruit, but this is not an effective long-term approach, especially as consumers become more sophisticated and more resistant to obvious marketing messages. Instead, marketers need to remember that the conversation is itself of value, because they can better understand their brand by seeing it through the eyes of their customers. It’s one thing to speculate about the role of a brand in people’s lives, and another to actually understand it. So, the good news is that I finished and submitted the dissertation last Thursday. I will have the full version online within the next couple of days. Honestly. However, in the meantime I will be posting some new content, including some of the interviews, as well as some of my thoughts on various social media issues. To start off with I thought that it would be worthwhile to jot down a few thoughts about what I learned from writing (and not writing) this blog. The first lesson is that keeping up your motivation to blog is not easy, as can be seen quite clearly from how I let this blog fall to the wayside! In the end, it proved very difficult – ok, impossible – for me to devote the time to blogging after spending an entire day researching, writing, and thinking about social media. The motivation simply wasn’t there, and so I let it slip. Which wouldn’t have looked very good for anyone arriving at this page, whether from a search engine, LinkedIn, or from another source. This was one of the ideas explored in the report, that starting some kind of social media presence and then giving up looks worse than not starting in the first place. And this was something I was guilty of! Oh well, in any case, this was actually a very good example of one of the themes of the report, which is that whether you are a company or an individual, if you want to use social media to help achieve your business goals then you need to be willing to devote the appropriate resources to the job. Depending on the circumstances, this may be a matter of money or manpower or time, or some combination of the three. In my own case, it was simply a matter of time – because I was spending so much of the day working on the dissertation, I didn’t really have the time to devote to creating proper content for this blog. I am employed at a Fortune 25 IT company that is forcing the senior technical leaders to blog and engage in social networking. I have told my management that I don’t have time to write a blog that will mean something to those outside the company. The response was: “Just do it … you only need to spend a couple of hours a week in the evening working on this.” Why should I sacrifice my time outside of work on this? There is no way that a good blog on some technical topic can be done in an hour or two. Should I protest further or get with the programme? This is a great example of a social media venture that is doomed to failure. OK, maybe not doomed, because strange things do happen in the world of business, but I certainly feel confident in stating that this is unlikely to work. Why? There are a number of reasons why. The first thing that struck me when I read this was that the company doesn’t have a clear idea what they are trying to achieve with this blog. Obviously I am working on limited information here, but from this description it seems like there isn’t a clear business rationale for this project. ‘Other people are doing stuff with social media, so clearly we need to do something as well!’ If only things were that easy … if you aren’t clear about what you are trying to achieve, how will you recognize success or failure? Furthermore, the company is treating it as an afterthought by asking its employees to devote their own personal time to this project. With the best will in the world, life has a tendency to intervene, so it is very likely that an initial burst of enthusiasm could carry this project forward before the volume of new posts got lighter and lighter before finally grinding to a halt. Which would just make the company look bad. If they really are serious about this project, then they should devote the proper resources to doing it well, by building time into the schedules of the employee-bloggers so that they can write on company time. If this project is not more important than any of the work that these employees are currently doing, then they should not be asked to contribute, which means that the writing should either be done by other, less important employees or someone should be hired explicitly to write the blog, whether as a full-time employee or on a freelance basis (depending on what they want to achieve). If the company is not willing to take these steps, then they shouldn’t start a blog in the first place.